A Traveler's Guide To Space And Time not only includes all the albums released during the so-called Virgin years (the record company brought out all the bands' records between 1988 and 2004) but also all their previously unreleased demo recordings, rare bonus tracks and alternative versions of famous pieces from this era, and all of them have been remastered and some even remixed. 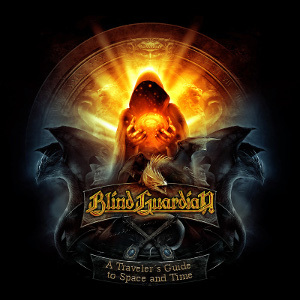 With A Traveler's Guide To Space And Time, Blind Guardian stay true to their reputation of not doing anything only halfway. As always with this band you get the full-on thing, on both the composition and technical production sides. This box is also full of rare photos from the musicians' private collections as well as previously unreleased demo recordings, once again documenting how far this group will go to give their fans the best possible product. And as Hansi Kürsch put it: "We poured our heart and soul into A Traveler's Guide To Space And Time making it a well worthwhile box for our fans which fully meets the demands we make of ourselves as well as those of our fans. And that is exactly what we were aiming for."